Thirty years ago next October, the tenor saxophonist Frank Foster and the drummer Elvin Jones brought their Loud Minority Big Band into a New York studio, recording enough material for an album. For various reasons that album was never released, and the master tapes went into storage. They have now been recovered, restored and newly issued as "Well Water" (Piadrum), a portrait of a sure-footed band during a transitional moment in jazz culture. Mr. Foster, who would later assume full leadership and stewardship of the Loud Minority, applies his formidable arranging skills to six songs, including three of his own. (One halfhearted original, with a jazz-rock groove that Mr. Foster disdainfully describes in the liner notes as "un-swing," reflects some of the era's tensions.) Several of the band's members make memorable solo contributions, none more so than the alto saxophone lead by C. I. Williams on ?There'll Be a Time.? That is, unless you count the drumming of Mr. Jones, an unmistakable force even in this setting, with so many other forces at play. The music on Well Water sat unreleased for 30 years but was worth the wait. Frank Foster's Loud Minority Orchestra only made a few records during its decade or so of existence and Well Water is one of its best. Listeners expecting the music to be similar to that of Foster's former boss Count Basie should realize that Foster's playing by 1977 was more strongly influenced by John Coltrane than by Lester Young, and that his writing is much more modern than that usually heard in the Basie band or even in the Thad Jones/Mel Lewis Orchestra. The performances do swing in their own way and include dynamic solos by the altoist C.I. Williams, both Foster and Bill Saxton on tenors, trumpeter Charles Sullivan and pianist Mickey Tucker. With Elvin Jones (making one of his few appearances with a big band) driving the ensembles and inspiring the soloists, this is an exciting effort. The closing number, "Three Card Molly," is a Foster quintet feature in which the leader switched to soprano. Highly recommended. FRANK FOSTER/Well Water: In between tours with the Basie organization, Foster had a big band of his own. The cut a steaming session in one afternoon fro a small label and the tapes were promptly lost for 30 years. Better late than never. Big bands exist on tier own plane so there's no issue of whether this material sounds dated or not, it was going for swing when it was made, not fashion. With a crew of pros that knew their stuff and knew what and how to do it, Foster and his gang should be more than a little miffed these notes were gathering dust for 30 years. A hard charging date that big band fans will be glad to hear has finally escaped. A forward looking date that might not always give you what you anticipate, pros are pros and even when they are pushing the envelope in direction you might not expect, it's best to sit back and expect the unexpected. You can't go wrong with this find. "Well Water will go down at year's end as one of the most important recordings of 2007." OK, how many reasons do you want to get this release of previously lost material from 1977? How about reason #1 being that Elvin Jones is the drummer that drives this 20 member big band through some creatively hard swinging charts. Co-Lead by Elvin Jones and tenorist Frank Foster (who wanted to do something besides recreate the Basie sound) this undiscovered diamond in the rough features some Coltrane-influenced charts that will please fans of both Trane and The Count. Hard driving swingers like "Joy Spring" and "Someone's Rocking My Jazz Boat" feature some clever section work that is reminiscent of Coltrane's landmark "African/Brass" sessions. Foster, switching between soprano and tenor, is stunningly modern during his solos work, particularly on the sole quintet piece "Three Card Molly". Altoist CI Williams is featured on some gorgeous alto sax work on the ballad "There'll Be A Time." Elvin Jones on drums is simply wondrous. After all, he did sit in with Ellington once in awhile. His touch is picture perfect for this band. It's incredible to conceive that this music was lost in someone's home for 30 years. This is definitely one of the discoveries of the new year. Grab it and give your ears a feast! Thirty years ago, saxophonist Frank Foster and drummer Elvin Jones escorted eighteen other musicians (whom Foster dubbed the Loud Minority Big Band) into a recording studio in New York City to tape an album, Well Water. The hope was that a label would be found and the music released for public consumption. That never happened, and as the months and years went by, it was widely assumed that the master tapes had been irretrievably lost. But Foster’s wife, Cecilia, remained unconvinced, and she began making inquiries. Lo and behold, not only weren’t the tapes lost, they’d been stored away in perfect condition for three decades in the home of the session’s recording engineer, Don Hunerberg. Hunerberg delivered the tapes to the Fosters’ emissary, Ron Aprea, paving the way for a happy, though delayed, ending. Well Water—better late than never, and expertly remastered by Jessica Shih and Dae Bennett—found a home at last on Piadrum Records, and everyone now has a chance to hear and appreciate Foster’s Loud Minority Big Band in one of its earliest and finest hours. The first half-dozen tracks are performed by the ensemble, the last—Jones’ muscular “Three Card Molly”—by a quintet comprised of Jones, Foster (on soprano sax), pianist Mickey Tucker, bassist Earl May and percussionist Babafumi Akunyun. Foster, who played tenor in the Count Basie Orchestra from 1953-64 and led the band from 1986-95, has always been about swinging, and Well Water certainly marks no departure from that precept. “The mood,” as Foster recalls, “was really up,” an appraisal that is affirmed from the outset. As a bonus, there are splendid solos by a number of sidemen whose names are relatively obscure today—trumpeter Charles Sullivan, alto C.I. Williams, tenor Bill Saxton, baritone Kenny Rogers, trombonist Kiane Zawadi and pianist Tucker. Williams and Rogers are among the members of the band who have since passed on—the others are Jones and Akunyun—while Tucker moved to Australia more than twenty years ago and hasn’t been heard from since. Williams’ soulful, creamy-smooth alto (shades of Marshall Royal) is showcased on “There’ll Be a Time,” the session’s lone ballad. More than a sentimental trip down memory lane, as Foster remembers it, Well Water is a splendid studio date by a first-class big band, and it’s good to have it available on CD after all these years. What a treat. Frank Foster -- saxophonist, composer, arranger and onetime Detroiter -- recorded "Well Water" in 1977 with his bracing and underrated big band, the Loud Minority. But the tapes were lost and are seeing the light of day only now. Beyond the visceral punch of the band and Foster's inventive charts, the major thrill is hearing Pontiac-born drummer Elvin Jones, known for his revolutionary small group playing, power a big band. On "Joy Spring," Jones swings turbulently behind the ensemble, as loose as ever but accenting ensemble rhythms with sideways ricochets. Foster's arrangements lean on modern, often modal, harmonies and rhythms far removed from his Count Basie days, but the craftsmanship is sharp and the ensemble is well-rehearsed. The soloists, including trumpeter Charles Sullivan, Detroit-born trombonist Kiane Zawadi (born Bernard McKinney) and pianist Mickey Tucker (on a horribly tinny piano) are fleet and fluent. During the ‘70s, saxophonist and composer Frank Foster formed and led a marvelous big band called The Loud Minority. They routinely performed challenging, varied pieces different from those featuring Foster in his regular role with Count Basie. Sadly, the Loud Minority didn’t have either a lengthy tenure or extensive recording legacy. This previously unreleased CD Well Water chronicles a 1977 session that stayed locked away nearly three decades. The seven-song menu contains invigorating Foster originals “Simone,” “Cecila is Love” and “Someone’s Rocking My Jazz Boat,” plus excellent covers of Clifford Brown’s “Joy Spring” and drumming legend (as well as Foster’s cousin) Elvin Jones’ “Three Card Molly,” a bonus cut spiced by Jones’ finest extended solo. Foster’s aggregation fuels precise, disciplined works, while his arrangements offer brilliant players pianist Mickey Tucker, saxophonists C.I. Williams and Bill Saxton and trumpeter Charles Sullivan ample room for stunning solos augmented by flashy transitional and complimentary statements by the full unit. Well Water is a wonderful document from a first-rate band that deserved far more acclaim and attention. Maybe it’s a good thing that Well Water , a 1977 recording by tenor saxophonist Frank Foster’s Loud Minority Big Band, sat on the shelves for 30 years. The ‘70s were long considered a no-man’s land for jazz, but recently jazz mp3 bloggers have taken an interest in reviving the often-disparaged decade. There is bright, crisp playing here, with bruising baritone solos, unusual contrasts between flutes and the huge brass section, and if at times Coltrane’s Africa/Brass comes to mind, it may be because of the presence of the late drumming legend Elvin Jones. Like the renowned orchestra led by his fellow Basie alumnus Thad Jones, Frank Foster's Loud Minority Big Band was focused on forging a more advanced big band identity. Foster is intimate with Thad's MO, having spent a few years in his band in the '70s, and this experience undoubtedly informed his own ensemble from that same decade -- harmonically complex arrangements combined with passionate playing. And while the results might have sounded rough in parts, the compositions always had their virtues –- shapely melodies, high- energy orchestrations and a wall of sound. With the release of Well Water, we can now hear some tapes that were previously assumed to be lost, providing a more complete portrait of Foster's vision. The recording sounds remarkably well-preserved, too. But unlike the funky, fusion-tinged maiden voyage of the Minority from 1974, Well Water is more straight-ahead. Foster's arrangement of "Joy Spring" takes Clifford Brown's already- complex piece to new levels of intricacy with a muscular reading from the band. Kiane Zawadi (who appeared on some notable '50s and '60s dates as Bernard McKinney) does admirably on trombone, and trumpeter Charles Sullivan gives a bright nod to the song's author, but tenorist Bill Saxton's agile, hard-blowing solo is the high point here. The title track is an adaptation of a Russian folk song, rendered as a driving 3/4 modal composition. Foster's tenor is intense and buoyant, leaping out from a well-blended reed section orchestration. Second only to "Shiny Stockings," "Simone" is probably Foster's best- known composition, and while it lends itself to a delicate interpretation, its creator isn't afraid to be bold. Saxton solos like he owns the tune. Here and throughout the session, pianist Mickey Tucker is luminescent, with flashes of Tatum and McCoy. It's Elvin Jones's wide-swinging cymbal work, though, that makes this a heavy and powerful chart, and his own solo is as much about texture and musicality as strength. His own composition, "Three Card Molly," appears as a bonus track -– a true workout for a quintet with Tucker, bassist Earl May, percussionist Babafumi Akunyun and a pure-toned, wicked, chromatic soprano solo from Foster. The other reedmen have most of the sax solos here, but Foster's voice is apparent enough in the music. His colleagues do him proud, of course, and often show a hint of his influence: virile, searching and touched by Trane. Just as Foster himself evolved beyond the mannered, swing-based saxophone stylings of Basie's band, his efforts with the Loud Minority furthered the possibilities for the large ensemble, and Well Water is a fitting example. Frank (ts) leads a brassy large ensemble performing seven well-developed popular compositions. It was recorded in 1977 but just released this year! It has aged well capturing fine performances of the late Elvin Jones (d), Kenny Rogers (bs), C. I. Williams (fl, as) and including pianist Mickey Tucker who has disappeared from the music scene. We liked Frank's "Simone" and "Someone's Rocking My Jazz Boat". The subtle passion of "There'll be a Time" also struck our fancy. This is swinging big band music of yesteryear that sparked memories of the past. Tenor saxophonist Frank Foster has had a storied career in jazz, mostly having played for the Count Basie Orchestra from 1953 to 1964. He’s authored a handful of popular jazz standards and one of them, “Shiny Stockings,” is a widely recognized classic. After leaving the Basie band Foster freelanced for Sarah Vaughan and Frank Sinatra, among others, as well as recording many solo albums. A new CD by Foster is actually not new at all. Long thought to be lost, Well Water (Piadrum Records) captures an historical session from 1977 by Foster and his Loud Minority Big Band. The tapes were recently discovered by engineer Don Hunerberg and listening to the CD now throws open a window on Foster’s skill as a bandleader and proves that forward-looking, straight-ahead jazz did not slip completely into a coma during the 1970s as many have suggested. The drummer on this date is Elvin Jones. While solid throughout, he’s particularly assertive during his solo on Foster’s “Simone” and the album’s wicked final track, “Three Card Molly,” a burner played by Foster on soprano sax that recalls the crackling intensity between Jones and John Coltrane. Kudos to Piadrum Records, an enterprising independent label, for restoring and making this important work available. Frank Foster's reputation is so wedded to the Count Basie brand - first as a key sideman and arranger from 1953-'64 then as posthumous leader in the 1980s and '90s - that his own impressive big band work has been relegated to something of a career footnote. This formidable set reminds us where Foster's heart really was all those years as he played "Jumpin' At The Woodside" and "Shiny Stockings" at every performance. Outside the rigors of the Basie catechism, even as amended and expanded (in part by him) during the '50s, Foster had his own notions about what he wanted to do with a big band, ideas that didn't always make it into his Basie work. One senses listening to this previously unreleased 1977 session that Foster's Loud Minority band was a necessary alternative. When he took over the Basie band in the '80s, he worked to create a blend, letting the Basie traditions breathe and evolve with his own. Though he was often successful, those elements could be taken only so far. All along Foster was touched by the shifts in the '60s in ways that could not easily penetrate the core Basie identity. Thus we have Foster's Loud Minority band, which did several albums in the '70s. This studio date was made before the band's first Denon Album, Manhattan Fever, but was never released. Using latter-day Basie as a familiar reference point, it's interesting to see where Foster, who serves as composer and/or arranger on all but the final track, reroutes from the mold and charts his own way. For one thing, it's a really big band: seven saxes and five trumpets. More to the point, the music transitions into alternate places. Actually, "Joy Sprint" is the kind of relaxed mid-tempo jaunt into which Basie might have slipped easily, especially on Foster's buoyant and bubbling sax ensemble following Kiane Zawadi's trombone choruses. But Foster's warm swinging tenor lines often stretch into the dense, effusive clusters of arpeggios that had become a post-Coltrane solo commodity, ill-at-ease in the Basie style. "Cecilia Is Love" would be an unlikely Basie chart. Thought it offers more of Foster's rich sax scoring out in the open, it moves to a Latin rhythm and features Foster's soprano in a modal mood and in a brief but intricate conversation with Charles Sullivan's trumpet. "Simone" is an unusually busy chart with a harmonic turn at every bar, as Foster explains in his detailed and informative album notes. "Someone's Rocking My Jazz Boat" is a minor blues with a funky but swinging feel that Elvin Jones endows with some real swagger. Main solos are by Foster and Bill Saxton in an expansive soprano flight. But the piece gets a bit winded in the last few minutes as it pushes farther and farther out. Foster turns again to the swinging-waltz methodology on "Well Water," but the solos often feel driven more by sheer energy than inspiration. Jones' tricky "Three Card Molly" is a small-group quintet encore in which Foster plays his most intense and unrestrained soprano of the CD. Pianist Mickey Tucker and Jones also get expansive space. Incredible discovery in the vaults, nice save and great to hear Foster and Elvin Jones. Just as boggling to think of this heavy big band hitting the studio between recording sessions for the first LPs by Blondie and the Ramones. Gotta love New York! Incredible Recorded 30 years ago and issued now for the first time, this rousing performance by saxophonist-arranger Foster’s ensemble is an immensely entertaining and sophisticated hard-bop big band romp. Foster made his name in the Basie band of the ‘50s, but he ventures far from the swing era with the Loud Minority – exploring waltzes, jazz-rock, Latin grooves, and modal and bop forms with a disciplined brio few big bands of any era have matched. Foster’s arrangement of Clifford Brown’s “Joy Spring” features beautifully detailed writing for the low brass and a contrasting chorus scored for flutes, as well as massive brass punctuations that goad bi-toned tenor saxophonist Bill Saxton into a wailing climax on his solo. Foster’s own “Simone” hides its challenging chords behind a catchy tune that dances over a waltz beat stoked by the powerful Elvin Jones. This is a band in which the ensemble playing is as important as the soloists, and the band shines on a nuanced reading of Foster’s lovely ballad, “There’ll be a Time.” Alto saxophonist C.I. Williams plays the melody and solos with a bluesy sensuality that’s direct and full of feeling. Trumpeter Charles Sullivan takes a lyrical solo on “Cecilia Is Love,” which also includes an intense Foster soprano sax solo. The only track that doesn’t sustain the album’s generally consistent level of creativity and intensity is (tellingly) the jazz-rock “Someone’s Rocking My Jazz Boat.” A bonus quintet track features Foster with the band’s rhythm section in a vibrant and joyful version of Jones’ “Three Card Molly.” Recording at a time when big bands were largely considered dead, the Loud Minority plays as if they want to bring big bands back to life all by themselves. Frank Foster Loud Minority Band, Well Water (Piadrum). There is more than curiosity value in this session that went three decades between recording and release. It may not quite qualify as recovered treasure, but the writing and ensemble playing are fine, and Elvin Jones's drumming is superb. In his liner notes Foster puts himself down, amusingly, but he solos well on tenor and soprano saxophones, and we are treated to several solos by Charles Sullivan, a drastically overlooked trumpeter. It's not often that one has a chance to review a brand new release whose music is thirty years old, but such is the case with Well Water, recorded in 1977, presumably lost, then "found" at the home of recording engineer Don Hunerberg where the master tapes had been stored in perfect condition for three decades. Frank Foster, more than a dozen years removed from his long-running gig as star tenor saxophonist with the Count Basie Orchestra, and the late drummer Elvin Jones were co-leaders of the ensemble that Foster dubbed the Loud Minority Big Band. This was to have been the band's second album but that never materialized, and the tapes sat forgotten until Foster's wife, Cecilia, began making inquiries. Hunerberg, who'd intended to contact the Fosters about the tapes but never got around to it, was happy to hand them over for remastering by Jessica Shih and Dae Bennett. As for the music, meticulously described in Foster's informative liner notes, it swings hard, as one would expect from anything in which he had a hand. It helps, of course, to have a masterful drummer such as Jones to drive the ensemble. Unhappily, Elvin is one of four members of the group who have since passed away. The others are baritone saxophonist Kenny Rogers, percussionist Babafumi Akunyun, and C.I. 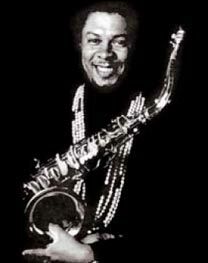 Williams whose creamy alto saxophone is showcased on the ballad "There'll Be a Time." After opening with Clifford Brown's classic "Joy Spring," the LMBB addresses the first two of Foster's four originals, "Cecilia Is Love" (written for guess-who) and "Simone." Foster also wrote the funky "Someone's Rocking My Jazz Boat" and adapted "Well Water" from an engaging Russian folk melody. The last track, Jones' saucy "Three Card Molly," is performed by a quintet that includes Akunyun, pianist Mickey Tucker, bassist Earl May and Foster on soprano sax. Worth a thirty-year wait? Listen and decide for yourself. Even listening to this big band work, it is hard to believe it was recorded back in the late 1970s and languished in a vault until last year. “Circles of Love” begins slowly and then shifts to a Latin groove complete with exciting unison saxophone chorus and a great baritone sax solo by Kenny Rogers. Trumpeter Charles Sullivan and leader Frank Foster also contribute. The Foster original, “Simone,” is a grand bash with the entire band swinging all over and under saxophonist Bill Saxton. Never mind the decades long delay in getting this music to market. It will still be fresh in the decades to come.